Can’t Bush Be Given at Least a Little Credit? For a nation President Bush labeled as part of the “axis of evil,” it was not an impressive sight: a dilapidated concrete hulk, built with few resources back in the early ’80s. But it did produce plutonium, enough to make a few bombs and to test-fire a nuclear weapon 18 months ago. Hmmm, so 18 months ago that same plant was fully operational and was making bombs, but Bush and his policy get no credit? So what happened then. Did Kim Jong Il just decide to become a benevolent dicatator and lose his ambition for a nuke for the good of the world? For all of this, North Korea expected a million tons of heavy fuel oil, a lifting of sanctions and removal from the U.S. list of terrorist sponsors. This has not happened yet, so North Korea has slowed down the disabling process at Yongbyon. The United States says Pyongyang hasn’t yet fully accounted for its past nuclear activities. However, both sides seem determined to overcome this stumbling block and reach out in other ways, too. So basically, North Korea decided to dismantle it’s nuclear program because the U.S. and other countries offered benefits. That sounds an awful lot like it is due to U.S. policy dictated by the Bush administration. I find it quite telling that CNN and Amanpour would fail to give Bush any credit for such a turn of events. I also find it outrageous that every other news source is ignoring this North Korea story, instead they are talking about the NY Philharmonic Orchestra playing in Pyongyang. This is a major story and a major victory, not just for Bush, but for the U.S. and the world as a whole. The sad thing is, Clinton’s agreement with NK was a complete failure, but if it were as successful as Bush’s it would have lauded and praised, but simply because it is Bush it is ignored and cast aside. What a sad state for our society and media. As a side note, purely discussing the NK nuclear program, I am still quite skeptical that they have dismanteled their nuclear program. I am not saying they haven’t, but I would not be the least surprised to find out that they have a secret plant elsewhere. Also, it is quite possible that now that they have their multiple nukes, they are content and decided to appease the U.S. I mean, how many nukes do you need to destroy Seoul. All we have heard about is a plant being dismantled, not about bombs. To compound the problem is the person chosen to replace Larijani, Said Jalali. 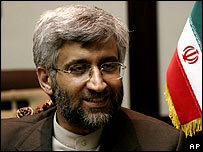 Jalali is a close ally to Ahmadinejad; perhaps even considered a right hand man. He fully supports Mahmud’s hard line stance on the nuclear program; intending to pursue it regardless of the cares of the outside world. Currently, Jalali is saying all the right things; fully intending to cooperate with the IAEA and international community to find a diplomatic solution. However, if indeed he is from the Ahmadinejad school of diplomacy, he will say one thing and do the opposite. In Ahmadinejad’s administration there have been two camps of Iranian political power; the Ahmadinejad wing and the Larijani wing. The latter, while still conservative, is much more pragmatic and really wielded the true power in Iran. Included in this wing are such prominent Iranian politicians as former President Rafsanjani and Hassan Ruhani, Iran’s National Security Advisor. In between these two camps is Ayatollah Khamenai, occasionally siding with the hardliners and occasionally with the pragmatists. Sadly, now it looks as if he has committed to Ahmadinejad and his ilk; indeed there is now a consolidation of power around the President. The thing most American’s (including the President of Columbia University) failed to realize about the Iranian government is that the President is really just a figurehead. He has limited real power. He has no right to dictate foreign policy or be involved in internal affairs. His is primarily domestic authority, of which most decisions have to be ratified by the Council of Experts and the Ayatollah. So for people in America to have been so afraid of Ahmadinejad and for the President of one of America’s most prestigious universities to call him a dictator, was really ignorant and reflected poorly on us as a people. However, now there is reason to fear, not because of Ahmadinejad per se, but because the Ayatollah seems to have completely joined his camp, and the Ayatollah is the true arbiter of Iranian power and foreign policy. The chance for a peaceful resolution to the nuclear crisis has diminished extensively.